The Washington County ICE Bantam B team played their first playdown game on Saturday, February 2nd. If they won, they secured a spot at state. They were slotted to play the Sheboygan Lakers Bantam B team as the two teams had tied for the top of their division. Washington County Bantam B lit the lamp two times in the first three minutes of play rocking the Lakers back on their heels. Tyler “Frankie” Bartz was first to find the net (Carson Phillips assist) followed quickly by Carson Phillips. Tyler “Frankie” Bartz continued the onslaught by adding a third point to the scoreboard (Carson Phillips/Jack Airaudi assist). Sheboygan tried to regain some offensive momentum by scoring one goal with seven minutes remaining in the period, but the Washington County ICE finished off the first period with a fourth goal before the buzzer by John Pfaff (Tyler “Frankie” Bartz assist) finishing the period ahead 4-1. In the second period, the game was a battle of the defenses and goalies. Both had their hands full with the highest shot totals of the game. Despite this ICE held Sheboygan to two goals and the Lakers held Washington County to one goal in the second. Sheboygan was first to score two goals close together narrowing the gap to 4-3, but Tyler “Frankie” Bartz was continuing his offensive dominance earning a hat trick ending the second period 5-3 (John Pfaff assist). The third period was a nail biter the whole way with Sheboygan scoring early and starting a Lakers late game rally by pulling the game to 5-4. Washington County ICE played physical but also were called on four separate penalties leaving the ICE short-handed for half of the period. Despite this Tyler “Frankie” Bartz found the net once more (unassisted) giving the ICE breathing room again with a 6-4 score. However, the Lakers were not done yet as they scored one with less than two minutes left on the clock pulling the game within one. However, the Washington County ICE Bantam B team hung in there even when Sheboygan pulled the goalie and the ICE sealed the deal with a 6-5 win at the final buzzer. The goalie Alex Champeny did an amazing job blocking 42 out of 47 shots in the game. On to the state championships they go! 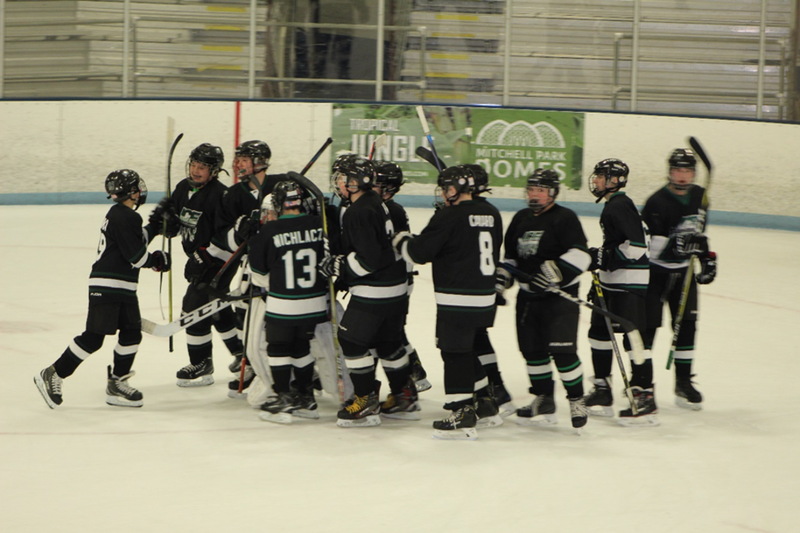 The Bantam B team will head to Oregon, WI – 3/1/19-3/3/19 for the State Tournament.